The big story was the attendance: There were some notable on-track happenings, not the least of which was trainer Jonathan Sheppard winning a race at Saratoga for the 46th straight year. There were impressive performances by little known – at least until Saturday – The Big Brute Beast romping in an entry-level allowance allowance by 6 1/4 lengths and two-year old Competitive Edge winning by 10 1/4 in a maiden. Then there was the event that miraculously did not become a tragedy when lightning struck a large tree in the back yard on Wednesday, shattering it and scattering debris around it. It happened 20 minutes following the last race and no one was injured. But I think the most significant event was the rebound in attendance after last year’s decline. After back-to-back days produced figures under 10,000, including a mere 8,044 on Wednesday, I thought the story was going to be the effect of the price increases enacted by NYRA this year. But Friday and Saturday saw significant increases over the last two years. Since NYRA no longer counts “spinners” in its paid attendance figures, I averaged the gate for non-giveaway days for the meet so far. This year’s average is 17, 969, an 11 percent increase over the same period last year, and 6 per cent over 2012. Speaking of giveaways, why does NYRA still do them? Saturday and Sunday drew about the same number of admissions – each day shy of 32,000. Saturday’s handle, however, was more than double that of Sunday. The per capita handle on Saturday was $181, with giveaway Sunday being a remarkably low $85. I know it is one of those time-honored traditions, and perhaps the loss of good will may not be worth it, but how do you give away free stuff and get nothing in return? We have the cooler barrier, one filled with trash and a tent practically in the paddock. 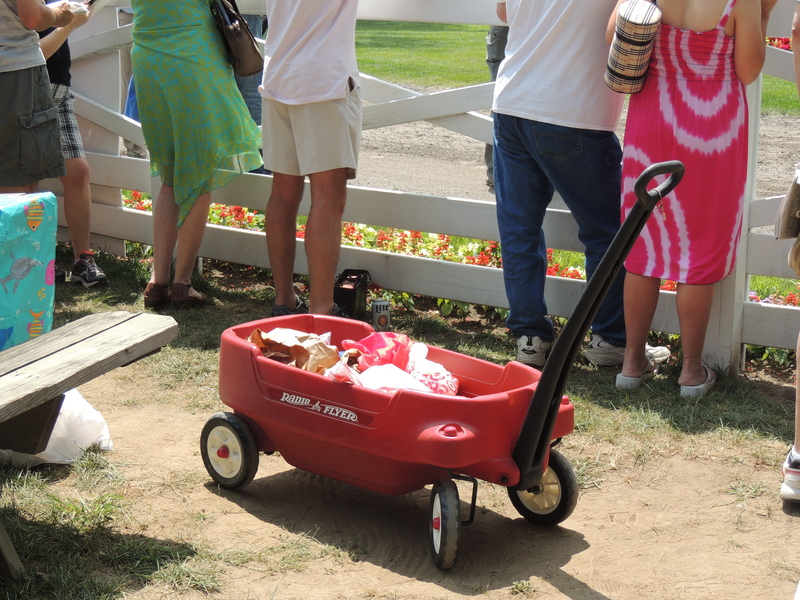 Going to the paddock has been one of the nicest features of the Saratoga race track experience, and it is a place one often brought kids for an up-close look at the horses. Now it has become almost inhospitable because of the efforts by a few customers to protect their space. Also, a second fence was put up somewhat recently following an incident in which a loose horse in the paddock crashed into the lone fence. Are horses that much safer now, or was it an opportunity to add some new picnic tables? Speaking of kids, what happened to the new play area? I thought one of CEO Chris Kay’s best ideas was an area to make the track a more fun place for children. In addition to activities, there was going to be a real horse to touch. When I went last Monday, the play area was there, but no horse. Now it turns out that the new area is only there on Mondays. Another day it is replaced by a New York craft beer tent. Now I am a big fan of craft beers – and New York has some good ones – but 100 feet away is a permanent booth selling New York craft beers. Saturday is devoted to a department store that is going to open an Albany branch, so instead of happy kids, we get a sales job. NYRA’s new “low roller” tournaments is a great idea: Following its introduction at Belmont, NYRA is hosting a tournament for those who may not want to spring for next week’s $1,000 buy-in. On Monday’s $40 gets you in with $10 going to prize money and the remaining $30 being “live” bets. Tournaments are a tremendous amount of fun, and here’s a way to experience it with a minimal cash outlay. There is more info on the NYRA web site. Accurate observations about the paddock! In addition, the introduction of the paddock-show tent to the paddock-yard has squeezed the space even further. 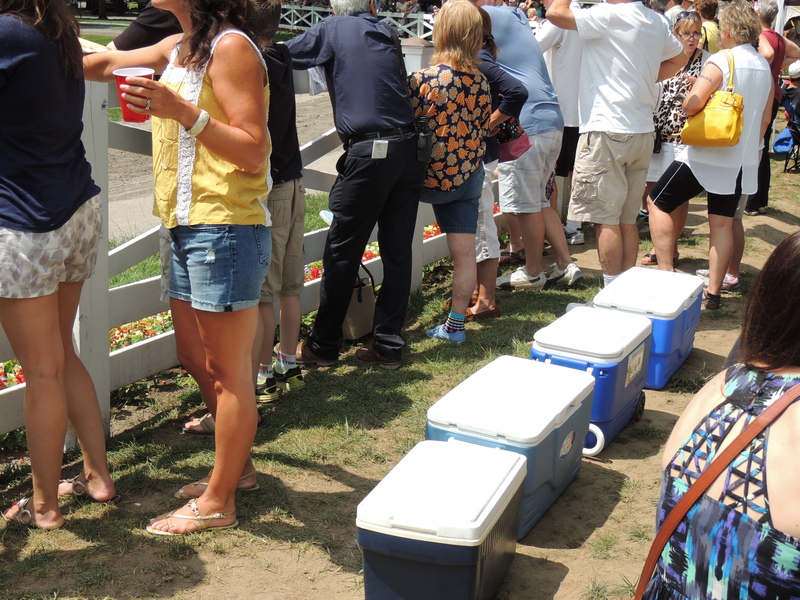 And in a related but equally ominous move, on the track apron, immediately prior to the Jim Dandy, some folks had put down chairs next to the fence, presumably to save their spots (like parking spaces in a Boston winter). An usher declined to do anything about it. If this trend catches on, there will be bloodshed on a busy Saturday, probably even prior to the Travers. Totally agree on the Paddock issue. It is like an obstacle course trying to get through the crowd. 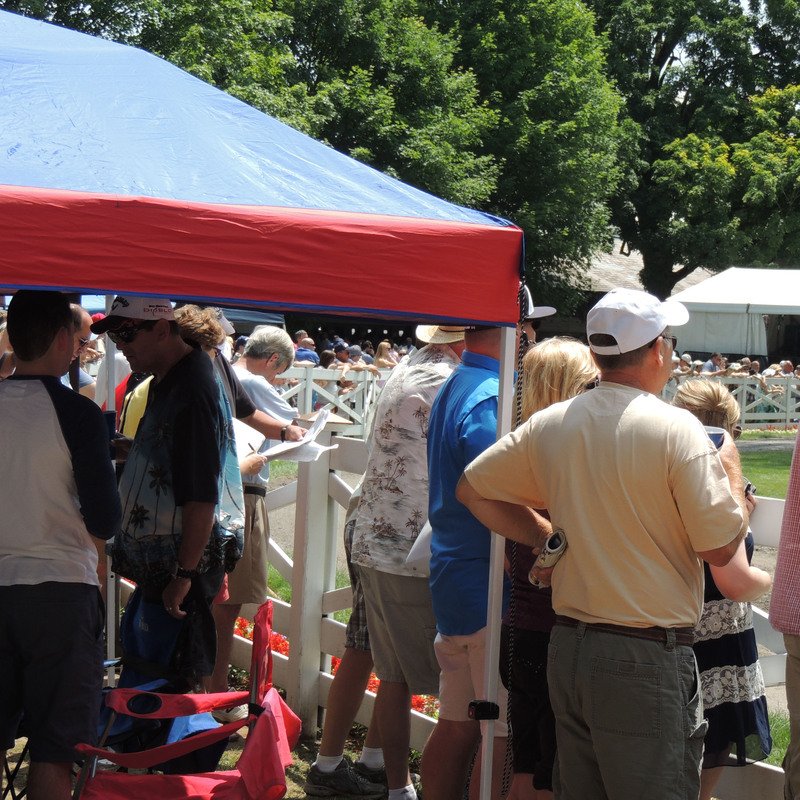 I actually saw a picnic table pushed up against the Paddock fence so people could sit on the table top and watch the horses.